"Oh but you are alone. Who knows what you’ve spoken to the darkness in the bitter watches of the night, when all your life seems to shrink." 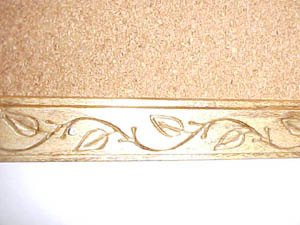 First, stain the engraved molding with the color or shade of your choice; you will not need to paint the back. To stain the molding you will need to paint it on then wipe it off with an old hand towel or a lot of paper towels. It works better if you have one person staining and the other wiping it off. Let the stain dry as you complete the next step. Next, lay out the roles of corkboard on the ground outside (or on an old towel) to keep from spraying your carpet. Then spray the back of the corkboard with your adhesive, making sure you get every part of the cork. It may be a good idea to go over the corkboard with the spray adhesive twice. Quickly spray the part of wall that you will be putting your board on with the adhesive. Now place the end of the corkboard on the wall where you sprayed the adhesive and smooth in onto the wall with your hand. This should prevent any wrinkles in your final product. After the molding is dry, hammer it over the sides of the corkboard. Be sure it overlaps the corkboard a little bit. This will create your frame. Finally, decorate! Use your thumbtacks to adorn your display board with drawings, pictures, quotes, or anything you want! Step 1 – Get pictures of characters you would like to make into figurines. You can find them in galleries and they should be full bodied, or else it looks a bit weird. Step 2 – Once you have your pictures, you can edit them on a Paint program found on most windows computers by erasing around the characters. This is optional and the only reason I did it was to save ink on my printer. Next you can arrange the pictures so as not to use up a lot of paper. I did 21 different sized pictures and fitted them on 3 sheets of paper… yes, as you can very well see, I really am very frugal. Step 3 – Now you can print them out and start cutting. Remember not to print characters on the front and back because you are going to cut them out … if you do so you will cut through someone on the back. You can cut them exactly around the edge, or you can cut close to the edge because it is easier. I did half-and-half, so you can do that too. Step 4 – When all the pictures are cut out then you can start to cut out of the cardboard. Place each picture on the cardboard so that you can fit as many pictures on the cardboard at a time. Then you will have to trace around the edge of each picture with the pencil. To avoid confusion further on, you might want to label each cardboard cut-out before you cut it out of which character each cut-out is of. Now you can cut out the cardboard to make your characters more sturdy and able to stand up. Step 5 – After finishing that, you can glue the paper to the cardboard. Very easy step, almost impossible to mess up. Step 6 – Now it’s time to make the character stand up and become a figurine. To do this you will need more cardboard. It’s easier to cut the cardboard out where the cardboard is at a 90° angle. Don’t cut on the angle, cut perpendicular to it so that you will have a strip of cardboard with a crease in the bottom part that goes up about one inch. For smaller cut-outs, the length from the crease to the bottom should be shorter. The strips should be about ¼ inches or smaller. Now you get to use tape. Turn the cardboard on the back and figure out how the figure should stand. If one leg is shorter than the other then you should attach the strip to that leg. This will lessen the amount of cardboard you will have to cut out because the figure will stand up on one leg and a strip of cardboard. Now you can tape the top of the strip to the back of the figurine. The bottom of the strip will be attached to the bottom of the cardboard by two very thin pieces of tape. One will be put on the inside of the cardboard and the strip, and the other on the outside. Do the inside piece first, and attach the strip to the cardboard. Then you can do the outside one. ** Note: If the figurine doesn’t stand up straight, then you can cut out a small piece of cardboard out and tape it perpendicular to the first strip on the inside-bottom. This is the perfect way to keep all your pictures, articles, artwork, poetry and stories together in one neat and tidy place. Glue or I find double-sided sticky tape works fine too! Special paper: it could be textured, wallpaper, patterned, pastel coloured, elven design? First take the notebook/sketchbook and back it in a pretty paper of you choice. It could have an elvish design or Celtic patterns? Whichever you prefer. Or maybe you could even make your own cover with paints and pencils. Next secure the paper with glue or double sided sticky tape. Then start with the first page and decorate it with your images/poetry/artwork. You could layer the pictures to create a collage, write a poem/quote in the center with a nice border, or something of your own choice. After that do the same with each page. You could even create a montage of moments from the film or book or a nice piece of calligraphy work on some pages. Let your imagination run wild! And when you have finished you will have a safe, tidy book full of LOTR memories and favourite art/pictures/poetry! Ever wanted to make your own Lord of the Rings-themed Treasure Box? I’ll tell you how! First, find the type of box you want to use. There are many different kinds out available – all kinds of shapes, sizes, and materials. I suggest getting one of those cardboard-like, papier-maché boxes, as these tend to work better, but whichever material you choose is fine. If desired, paint your box the color you chose. This color should also correspond with your pictures. Set your box out and make sure that it is fully dry before continuing. If needed, apply a second coat. Next, choose the picture(s) you want to use. Make sure the picture fits on the box how you want it to, and make sure the pictures look good together. Caution: If you printed your picture out, make sure that the ink is dry. Position your pictures on the box, making sure they all fit and look the way you want them to. To make your pictures more interesting, cut borders around them, make them different shapes, singe the sides with a heat gun (be careful!) or even put text or quotes around them. Whatever you want to do to make them more vibrant is fine! Lift one picture and spread a thin layer of Mod Podge with a spongebrush underneath where the picture was. Place the picture back down on top of the Mod Podge, making sure there are no air bubbles underneath by smoothing the picture with your hands or with a clean, smooth, dry cloth. Do this gently, as the colors on the picture may run. Follow the same procedure for all of your pictures. If you can’t get all of the air bubbles out, don’t worry. It won’t ruin the project, it just won’t look as nice. Allow box to dry. It’s advisable to leave your box sit out overnight to make sure that it’s fully dry. You’re done! Enjoy your Lord of the Rings Treasure Box! Here are a few that my sister and I made…… pretty cool, eh? 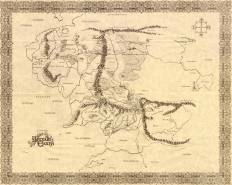 Have you always wanted a great authentic-looking map of Middle Earth to hang on your wall, but either couldn’t find just the right one, or couldn’t shell out the big bucks for it? Well, now you can make your own! First, search the web for a nice large map-I used one from Taylor Custom: he has kindly posted his maps for everyone’s use. I wanted a large map, so I used the file for the map that was spread out over 6 letter sized pages. Print out your map, and if you’re using the large one that encompasses 6 sheets of paper, tape them down to your drawing surface, after trimming off the blank edges left by the printer. Next, get some large paper – I went to a moving and packing supply store and bought a roll with large sheets of cream colored packing newsprint; it was about $3 for a roll of 100 sheets. You’ll want to make sure your paper isn’t too opaque, because you’ll be tracing from the map you printed out. Tape it in place over your map sheets. Before beginning, test a few pens out on scratch paper, to see how you like the quality of the ink and the width of the pen point. I decided on a medium point black gel pen-the ball point pens didn’t flow smoothly enough, and I was wrecking my map by having to retrace constantly, or it wouldn’t pick up the small details well enough. Keep a couple of extras handy, because you’ll be going through more than one with a large map, and you don’t want to return to the store half way through to find that they’re out of the kind you were using before; your map will look funny if it’s done with two different types of pens! Trace the map, and take your time! You might notice some shifting of the paper from time to time, so be sure to check periodically, to make sure you’re not going off course. Once you’re all done, it’s time to “age” your map. I can’t stress this part enough: Do not age your map without experimenting on scratch paper first. If you skip this step and ruin your map, you’ve got no one to cry to but yourself, and believe me–you’ll cry. Take a sheet of paper exactly like the kind you used for your map, and doodle on it a bit with the same exact pen you used. Using the same pen is important, because some pens will bleed and turn purple when aged, so you want to know how yours is going to look. Brew some strong tea, and stain the paper with it. You can then either dry it out in the oven (low heat, check it frequently), or for a more “yellow” look let it dry on the dash of your car in the sun. There are all sorts of ways to do it-try experimenting with tea, coffee, tea with yellow food coloring, and all sorts of drying methods, as well as scorching it a tiny bit with a candle or lighter. Play around all you want, until you get the desired effect. Finally, when you feel confident enough to “age” your real map, go slowly and carefully, and make it your own. When you’re done, you can put it in a frame behind glass, or just tape it up on the wall. Voila – your very own Middle Earth Map! Here’s how to make an aged-looking Middle-earth sign to place on your walls or doors. I have tried a few different ways to age paper, and I think this one is easiest. You probably have the materials already in your home and it does not take very long to make your sign. Permanent marker, like a Sharpie. I use fine-point black, but you can experiment and see what you like best. Paper, whatever kind you like. Construction paper can give your sign more texture, but regular printer paper works fine, too. Just make sure it is white or cream-colored, or aging it won’t work. Milk or citrus juice like lemon or orange juice – few tablespoons worth. Silver or gold-colored pencils, the shiny kind. A short stick between pencil and finger thickness, a foot or less long, or alternatively a foot or less of cloth ribbon. Begin by writing or drawing your message or picture on your piece of paper. Start with the pencil, and go over it again in permanent marker once you’ve got it the way you want it. I like to do an outline of the letters and fill it in with silver pencil when writing elvish characters; it comes out very nice that way. When you’ve inscribed your message, wait for the ink to dry completely, and then cut your paper into the shape you desire, leaving at least a couple inches of blank space around your letters or designs. Then, dunk the whole sheet in water to soak it. At this point you can curl the upper edge so you can glue on your stick or ribbon when it is done. Turn on your oven to 350 degrees F, and while you wait for it to heat up, pour the milk or juice onto the paper, spreading it evenly over the soaked sheet. Then, tamp the sheet dry with a paper towel, place it on the cookie sheet, design side up (if you put it directly on the rack it will get funny little lines all over it), and pop it into the oven. It should only need about 5 minutes to develop a brownish color, but keep a careful eye on it to keep it from burning. Take it out carefully, and wait for it to cool. When cool, rub the paper gently with a charcoal pencil or use ashes to give it a more aged look. You can also char the edges with a lighter- careful not to let the flames engulf your sign! A tiny touch, then blow it out and let the ember burn up a bit to make the edges uneven. Then, attach your stick or ribbon to the curled upper edge of the sign and find a place to hang it! 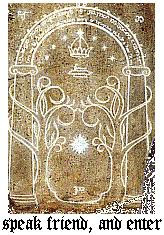 Wouldn’t it be great to have a painting that glows under moon and starlight like the Doors of Durin in “The Fellowship of the Ring”? Well here’s how to make one, except instead of moonlight we’ll use black light! Most of these materials are found at art supply stores and in the school or art supplies section of department stores. Black light paint was a little harder for me to find, but you could probably find it in art supply stores, on the Internet, or anywhere they sell black lights. The brown paper you use to draw on will give it an archaic parchment look. I’ll walk you through how I made my “moonlight” poster to give you an idea how easy it is. This is the drawing I used for my poster. First, cut out the amount of brown paper you need. Then spread the paper on the floor and sketch the drawing with a pencil and a ruler. Once you have it all sketched out, outline it with a black marker. Make sure you have it drawn out the way you want it cause the marker will make it permanent. If you want you can draw, outline, and paint a mini version out for practice. 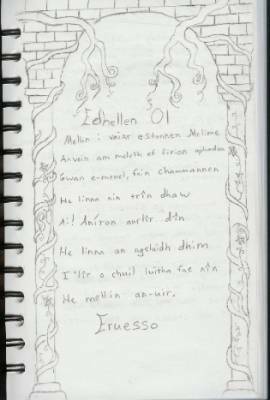 I outlined everything except for the Elvish poem in between the pillars. 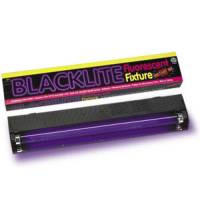 The black outline will make the black light paint stand out under the black light. After outlining you want to start painting. I painted the detailed parts of my drawing under the black light so I can see where I missed a part. Some colors will stand out better than others. My black light paint set came with blue, yellow, purple, green, red, and orange. I used blue for the pillars, green for the vines, purple and red for the flowers, and yellow for the text. If you want to make a black light poster of the Doors of Durin you’ll probably want to use blue or yellow blacklight paint, and you’ll probably be better off with black constuction paper as your background. I also painted my name in Tengwar and framed it. Just be creative and soon you’ll be enjoying the beauty of your Moonlight Painting. strips. It is easier if you measure the newspaper with a 8 1/2 x 11 piece of paper, then cut to size. 2) Rub a gluestick along the bottom of one sheet of newspaper and stick it to the bottom of another sheet of newspaper, so that the strips are joined together. You can choose how many strips you wish to use. I recommend 3-5 or else the parchment may beome long. 3) Pour the pva glue into a container and mix with with equal parts of water. Make sure it isn’t too runny! 4) Cut or rip toilet paper or paper napkins into small strips or pieces. 5) Using a paintbrush paint a portion of your glue mixture onto newspaper (use smalll amount or it will sog) Place napkin or toilet paper pieces over glue. Paint another layer of glue over pieces. 6) Repeat step 5 until you have covered one whole side of your newspaper strip. 7) You may add 2 layers if you want your parchment to be thicker. 8) Let it dry for 1-2 nights. 9) Repeat steps 4-8 on other side of newspaper strip. 10) Mix paint with a few drops of water to lighten or use real light brownish yellow paint (or use brown and yellow paint separately). 11) Paint one side of your parchment a lightish brownish color. Dab on smears of yellowish paint for aged effect. NOTE: You may trim the edges of your “parchment” but I recommend you do not because it rips and appears white due to paper. You may choose to do so but you have to fix it up later. Using a black marker, write whatever you want down on your parchment. Pen doesn’t work well and will rip parchment. I highly recommend a thin black permanent marker. A sharpie will do best. Show off your work! You may frame it or bore two holes in the top two corners and hang it up using a string. OPTIONAL: For a more aged effect, you may bend and/or crease the parchment. GENTLY though or it may rip. * If these instructions are too confusing, PM me. Carancoe’s tips on the care, storage and presentation of posters in your bedroom, and pictures in your locker. Always hang posters using a poster hanger. These are small plastic rods that clip to the top and bottom of your poster, keeping you from using tape. They are inexpensive ($2.50 CDN), but hard to find. Generally, good poster stores will carry them; you can also try office supply or large department stores, or mail order. You should use a small nail to fasten the poster to your wall. Do not use large or construction nails, as these may puncture electricity wires or copper pipes. For the purchasing of a poster, know what you are getting. A theatrical poster will have the credits at the bottom, where they are still visible when rolled up. A teaser poster will often have the date of release at the bottom. Often, poster stores will think they are selling the ‘Official Theatrical Poster’ to you. Make sure you know what you want, and don’t settle for less. Never buy over the Internet without having a picture of what you are getting, as people will often mistake a teaser poster for a theatrical one. Presentation is important. Keep posters level and parallel to the ones nearby. If you are seriously considering having a collection, measure out where you want certain posters to go. Simply haphazardly tacking them up can cause mass chaos, and a big mess. While storing posters, keep them rolled up in a cardboard tube, and preferably sealed. Do not leave them laying around, or play with them, as this will cause scratches and blemishes when you finally do find time and a place to hang them. Tape the paper tightly on the door, so that it is not folding out. To keep them preserved, you can laminate them before taping them up, or tape over them with clear packing tape. Magazine clippings will also work well. If ever going to a Lord of the Rings show (i.e. the exhibits that run in Toronto) collect at least two of the booklets or programs, so that you can use one for the pictures, and one for keepsake. Many movie theatres will give out free magazines that carry pictures for upcoming movies. Collect these. Try to select a good place for your pictures and posters. Try not to place them where they will be scratched or hit a lot, as these will damage them. A good poster collection is one that is well cared for and clean. Wipe your posters with a paper towel or clean, dry cloth. Using water will cause even more damage. With care in collection, display, and upkeep, your poster and picture collection should give you many years of enjoyment. Scothia’s note: Don’t forget the great selection of posters and prints available through the CoE store! Using Sculpey III polymer clay, I made two balls, one bigger as the body, the smaller as the head. I squished the first a bit, to form it into a more bodylike shape, and cut a slit for legs. Then I stuck the head on, added features, and used two small snakes as the arms. I also used small balls for the hands. The hair is a sheet with added clay for realism. Try it yourself! After following the above pattern, bake at the required time and oven temperature, following package directions. Be very careful, as the polymer clay can burn. Let set before touching, as the warm clay is easily broken. Legolas stands about an inch tall. This is a creative way to recycle an old, throwaway condition book. The first thing to do is to find exactly that, an old, beat up book; hard-backed, of course. Look for something at a thrift store, maybe with torn pages or coffee spills, even slightly burned. Just make sure that the binding is still strong and that it’s not a first edition or signed. Usually, books like these are pretty inexpensive and easy to find. After you have selected your book, look for images that you can affix to the pages. Some that would work excellently can be found in our very own Gallery. I’m using some Nasmiths from the Silmarillion in the front of my book, then moving to images from the Hobbit, and finally Lord of the Rings. Anything will work, as long as you like the image. You can also get pictures from sources such as magazines, old books, and the like. Once you have selected your images and either printed or clipped them, start planning the layout of your pages. You can paint and antique the pages or paste some decorative papers to them. Using fabrics and laces work as well, and sometimes create a nicer effect. For example, behind a picture of Arwen, paste a plain, light blue paper covered with a darker blue lace. After you have decorated your background, attach your images. If you are using images printed from your computer, you will need to use double-sided tape or some way other than glue, as the ink will run. Even if it has dried completely after printing, the glue will still make it run. Trust me on this one, I learned it the hard way! Be creative with your placement, using angles and collages. Now that you have your images placed and your backgrounds decorated, embellish your pages. Use calligraphy pens, embossing inks and powders, rubber stamps, stickers (if you can find any that will work with LotR themes) and the like to create elaborate pages. You can purchase metal charms, rhinestones, and other things from your local arts and crafts supply store. You can use archival quality supplies, but images printed from the Internet will probably not be archival quality, especially if you are using an inkjet printer. Finally, have fun with this project. It’s a great way to gather all of your favorite LotR pictures in one place. Always keep your eyes open for things that you can use, especially if you find yourself at an antique store, flea market, garage sale, or estate sale. Sometimes when you can’t find a stencil or a design is simply too difficult to freehand, the only answer is to transfer the pattern … here’s how! 1) Take the original copy of the design and trace completely over the design that you intend to transfer darkly with a pencil. 2) Place the image that you just traced upside down on top of the surface that you’re transferring to. 4) Lift up the paper and the design should be lightly transferred onto the surface. 5) Go over it with paints or permanent markers. NOTE: If you are transferring writing (or just have something in your design that can’t be left backwards) you will have to transfer the design to a sheet of paper, then transfer it again to your surface. This way it won’t be backwards. This technique can be used on doorframes, doors, walls, and even floors! Have fun! Trace the One Ring script around your window! Well we are all fans of the great Lord of the Rings movies, and now you can show it in a very simple way. All you need is a computer, printer, special paper, an iron, and a shirt! First you should go out and by the special iron-on paper. I found mine at Walmart. You can also buy it online here. Once you have the paper, you need to get to your computer. Since we need a picture of something Lord of the Rings to put on our shirt, I suggest you go to the CoE gallery. Once you have a picture selected, you should save it to your computer, and if you would like to, add words to it. I selected a picture of Gimli, and added the words “Nobody tosses a dwarf!” onto mine and it looked great. Now you need to print off your picture onto the special paper. The package that you bought the paper in will describe how to print it off the correct way. Be sure to cut around your image all the way so you don’t have extra white along the sides, that might make it look odd. After you have your picture printed you now get to iron it onto a shirt. The shirt should probably be white, or something close to that color seems to work best. You might want to ask your mom or dad to help with ironing it on just in case so you don’t get hurt. The package should also tell how to iron it on properly. This is a brilliant range of projects, thanks! LOVE LOVE LOVE the t-shirt idea! i think i am going to make one for every character (save the orcs!) in LOTR and put a quote by them below. my very own LOTR closeline! lol thank you!